​A touch sensor created by researchers at the University of British Columbia can be used with flexible and foldable displays. 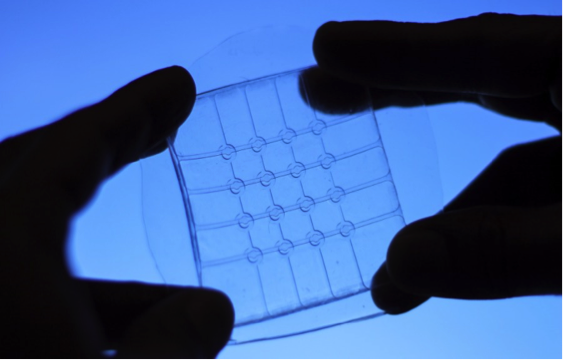 The sensor comprises a highly conductive gel stuffed between layers of silicon. It is capable of detecting different touch gestures such as tapping and swiping. It is also possible in case the sensor is stretched, folded, or bent. The sensor is created out of materials that are cheap and can be harnessed without much difficulty. Their work combines the capabilities of pressure detection sensors like Apple’s 3D Touch, hover detection sensors like Samsung’s AirView, and sensors that are foldable, stretchable, and transparent. The team published a paper in Science Advances. Currently, their sensor is limited to a 5×5 cm proof-of-concept, but it can be advanced for low-cost flexible displays. They also suggest the possibility of propelling the sensor into a something that’s a touch-sensitive surface covering a whole room at the cost of just a few dollars per square meter. And it can be used to detect the number of people in the room. Sarwar’s supervisor John Madden anticipates that the sensor can be used to design soft robotic skins in the future.